The PCE-HT 225A / PCE-HT 75 hardness meter for concrete is easy to use and it is used in the construction industry as well as in other industrial sectors (testing for Wickel hardness of rolls in commodities). This hardness meter in the form of a hammer device for testing concrete is based on the Schmidt principal of measurement. The measurement is always done with the same amound of impact energy. The impact power depends on the model you choose. The hardness meter PCE-HT 225A has a testing energy of 2.207 J and in contrast to that the hardness meter PCE-HT 75 works with an impact energy of 0.735 J. The kinetic energy of the rebound is given by the device as the measurement of the hardness of concrete, of the pressure upon the surface or as the resistance to pressure (kg/cm² or its conversion to N/mm²). The quality of concrete is useful in understanding the material resistance to pressure, as an orientating value for testing the load capacity and durability of concrete constructions. The PCE-HT 75 of the hardness meter has a notably lower impact energy than the PCE-HT 225A. This makes it possible to check thin-walled elements which have a thickness of less than 100 mm. Resitance to pressure is represented as a series of numbers and letters, for example: B 25 indicates that the material is normal concrete with a resistance to a pressure equal to 25 N/mm². Different readings exist up to the highest class of resistance which is indicated as B 55. 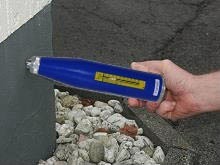 With our hardness meter you will be able to easily and accurately classify concrete. The hardness meter comes calibrated from the manufacturer but an ISO calibration certificate can be ordered seperately at extra cost. If there are any questions about these products, please call: UK customers +44(0) 23 809 870 30 / US customers +1-410-387-7703. An overview of all hardness meters can be found here: hardness meters. Our technicians and engineers will gladly give you advice on this professional hardness meter and all other products in the field of measuring instruments, regulation and control, laboratory equipment and scales. Resistance to pressure is normally determined in laboratories using cubes or cylinders of concrete. Once the concrete sample is chosen, it is recommended to immediately prepare flat and smooth upper surface. Cylinders are very durable. In places where it's not possible to take measurements with methods used in laboratories, a hardness meter, with an easy to use hammer, is applied. The image to the right shows the hardness meter measuring a plinth of an old wall in an old factory building. The plinth is not inlcuded and for this reason, the measurement is made on the painted concrete surface. The degree of hardness is obtained accurately after the measurement is done using the rebound body (rebound value = R) upon the surface of the concrete and with the help of a conversion table on the back or in the user manual. For companies that wish to incorporate the device into the internal quality control tools or for annual recalibrations. The ISO certificate includes a calibration and a document containing all the calibration readings. 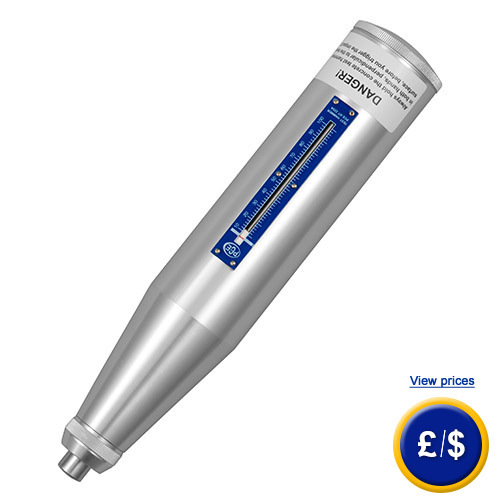 Aside from an ISO calibration certificate, we can also offer an ENAC calibration. As this is not yet treated as a standard laboratory calibration, please contact us by phone or by fax to get more information. One of our technicaians will provide you with further information and they can also give you a quote and schedule your ENAC calibration.